What can we learn about the open ocean from tracking white sharks? In this short video I provide an overview of some of the results of our work that investigates the use of mesoscale eddies by large pelagic fish. In the coming week, we will again venture into the North Atlantic to continue our investigation of the role of eddies in structuring pelagic ecosystems. Even though it feels like we just returned from our first cruise (November-December, 2015), we have had a bit of time to digest some of the observations made during NAAMES-1. During our first expedition, we discovered that eddies indeed have a significant influence on mesopelagic fish. Eddies affected not only the depth at which these organism live, but also their abundance. 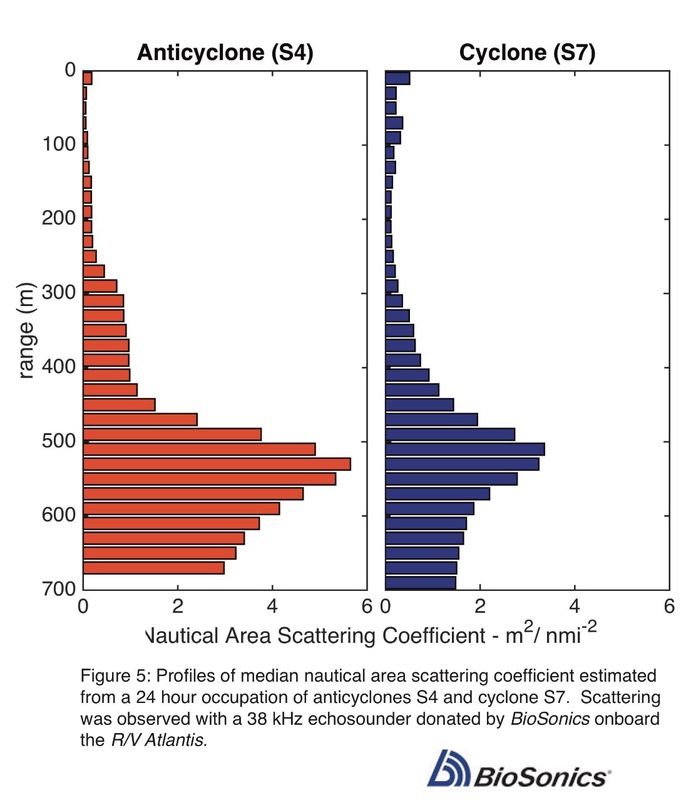 Using our custom-built deep-water echosounder (the RUMP), we observed that deep scattering layers, the acoustic signature of these mesopelagic ecosystems, are not only deeper in anticyclones, but also have stronger back scattering, when compared to cyclones (Fig. 5). This suggests that the observed pattern of white sharks preferentially using anticyclone eddies may be the result of these eddies affecting their prey. In the weeks to come, we will expand on these observations and surely gain more insight into the roles of eddies in structuring pelagic ecosystems. This entry was posted in Sharks and tagged eddies, mesopelagic, NAAMES, oceanography, sharks on May 4, 2016 by pgaube. 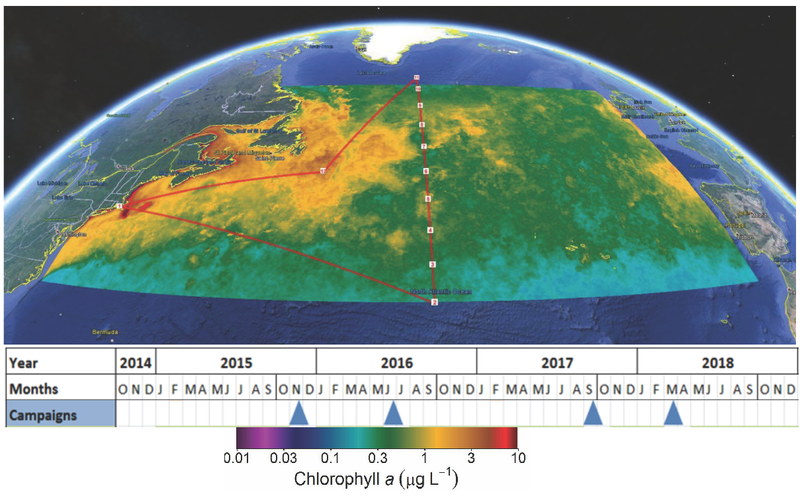 In preparation for our May expedition to characterize the variability of phytoplankton, zooplankton, and mesopelagic fish and squid in the North Atlantic, we wanted to compare the location of mesoscale eddies observed in maps of sea level anomalies with a stunning image of ocean color (phytoplankton) generated by NASA. There are a number of interesting features that can be seen both in the altimeter data (contours) and ocean color, including cold-core (cyclonic) eddies south of the Gulf Stream and warm-core (anticyclonic) eddies north of the Gulf Stream. This comparison of the high-resolution ocean color image (pixels are between 500m and 1km in size) with contours of the AVISO sea level product (with pixels of ~25 km) highlights just how much of the variability in marine ecosystems occurs at scales not resolved by the current generation of satellite altimeters [the submesoscale, O(1-10km)]. Our ability to observed smaller eddies and fronts will be greatly improved with the advent of swath-altmetry (SWOT, launch date around 2020-ish). At these smaller scales, however, the assumption we use to derive currents from sea level will have to be reconsidered if we are to investigated the dynamics of physical/biological interaction at the submesoscale. This entry was posted in Uncategorized on March 31, 2016 by pgaube. If there is one instrument that can be considered to be the core of sea-going oceanographic research, it’s the CTD package. CTD stands for Conductivity, Temperature and Depth. It’s deployed on a long wire from a winch into the depths of the ocean. The measurements of temperature, salinity (estimated from conductivity) and depth allow us to study the stratification, or layering, of the ocean. From this we can derive the currents, estimate mixing, and define how close to the surface the plankton are likely to be confined. But our CTD, or “package” is special. In addition to the core measurements, we are measuring optical properties of plankton to estimate their biomass and how happy they are. We also have a little robot that take pictures of all the little beasties that fly by as the “package” goes down to 1,500 m, and then back to the surface. Deploying the package is quite an ordeal. The video below shows the process, sped up by 2000%. Depending on how deep we are doing the cast, or deployment, the whole process takes from 1-3 hours and involves a total of 6 people directly, plus the crew on the bridge who make sure we are always facing into the waves and not in danger. 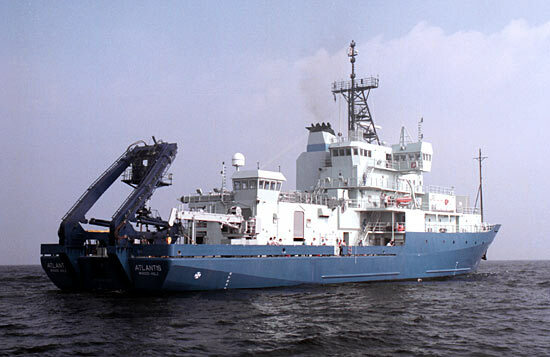 A crewmember mans the winch, a technician on deck orchestrates the whole ordeal, and four scientists tend the lines and trip the bottles from the computer lab. CTD_small from Peter Gaube on Vimeo. Oh yeah, the bottle, argh, those bottles. In total, there are 24 bottles on the CTD that collectively are called the “rosette.” These bottles are held open until an electrical signal is sent down the cable to the CTD telling them to snap shut, trapping 10-liters of water in each bottle. The water is brought to the surface and quickly sampled by a swarm of scientists who analyze the samples for a multitude of measurements, including the rate at which viruses attack plankton, how many plankton there are, how fast they are growing, how green they are, and who is around eating them and at what rate. Overall, on this field program, and most oceanographic cruises, the backbone of our sampling comes from the CTD package. I’m just the lucky guy who gets to send it overboard and make sure it comes back on deck safely and full of water. This entry was posted in Uncategorized on November 17, 2015 by pgaube. We’re heading east, a bit slower than before, but we are making good time. The waves have come up a bit and the science is in full swing. There are hundreds of measurements being made each hour, with countless continuous measurements of the ecosystems and physical environment, ranging from ocean properties to aerosols and clouds. The wind has come up a bit and we are on tail end of a storm. We will be following the storm for the next two days, but luckily we move at 11 knots and the storm is much faster. Nevertheless, we expect 30 foot (10 meter) seas tomorrow. I took a short video of the back deck today before the seas came up and they had to limit our access to avoid anyone being washed off the deck. At the time the video was taken, the seas were no larger than about 15 feet (5 meters). I have a bet going with some of the crew that the incubators (the plastic water filled boxes seen strapped to the deck on the video) won’t make it until morning. A normal day on the North Atlantic aboard the R/V Atlantis from Peter Gaube on Vimeo. For a more “human” perspective on the research and people aboard, follow Nicole’s blog. Nicole is a reporter who decided, last minute, why not spend a month in the middle of the North Atlantic, in November. This entry was posted in Uncategorized on November 8, 2015 by pgaube. We’ve left port and are steaming east, northeast towards our first station. We will be cruising along the shelf at 11 knots for the next few days. Our first station will be in an anticyclonic eddy near 50 degrees N (this is eddy A1 in the map below). Map of our cruise and track and eddies. It’ going to take us another 6 days to get there. During the transit, samples are being continuously analyzed from the through-flow system which takes sea water from just below the surface and pumps it through a multitude of instruments. We have also started to collect acoustic data using the ship’s acoustic doppler current profiler (ADCP). Although this is an echosounder that is designed to measure ocean currents, but I’ve also been looking at the amplitude of the acoustic backscattering in the water column. Yesterday around sunset, we observed the vertical migration of zooplankton and micronekton (little beasties that eat smaller beasties and plants) to the surface. It was exciting to watch this unfold in real-time. At the same time, we started to see these little critters in the imaging flow cytobot. Check back in a day or two and I’ll post a short video giving a tour of the ship, our home for the next month. This entry was posted in Uncategorized on November 7, 2015 by pgaube. Preparations are under way for the first cruise of the NAAMES field program. We will be leaving from Cape Cod, MA, on November 5th to conduct a 30-day cruise into the North Atlantic. Our mission is to characterize the marine ecosystem, from viruses to phytoplankton and all the way to mesopelagic fish, with the goal of quantifying the links between ocean variability (seasonality, eddies, and fronts), marine ecosystems and aerosols. We will be on board the R/V Atlantis, a 142-foot, steel-hulled research vessel operated by the Woods Hole Oceanographic Institution. Our cruise will take us from Massachusetts, up to about 48 degrees north, and then down along 41 degrees west to approximately 38 degrees north (see planned cruise track below). The planned expedition path overlaid on satellite estimate of the April mean climatological chlorophyll-a concentration. The NAAMES program time line is shown along the bottom of the figure with blue triangle indicating planned cruise dates. My primary research goals on this cruise will be to help guide the ship into mesoscale eddies using real-time satellite data. I will also be deploying 20 surface drifters that we will use to study the movement of the eddies and help guide the NASA C-130 aircraft to fly over and sample the eddies. In addition, I will be collecting multi-band acoustic observations to characterize deep scattering layers, layers of fish and squid below the sun-lit surface layer of the ocean (what is often called the “Twilight Zone”) inside and outside of the eddies. This research is motivated by recent observations of the use of eddies by white sharks. We have observed that sharks dive deeper and longer in anticyclonic eddies when compared to cyclones (more info here). Our hypothesis is that this is because deep scattering layers, where the sharks are feeding, are deeper and have higher biomass in anticyclones than cyclones. I will try to post semi-regular updates during the cruise, so please come back and see what we are doing in the coming weeks. You can see where the ship is here. Schematic representation of isopycnal surfaces (thin black curves), white shark dives (wavy black arrows) and the DSL (pseudo-color) in (a) anticyclonic and (b) cyclonic eddies. The detection of the DSL by ship-board acoustics is indicated by the cone of solid downward propagating waves with the returned signal indicated by dashed upward propagating waves. This entry was posted in Sharks on October 29, 2015 by pgaube. Two days ago I reported that Lydia swam towards a large anticyclonic (clockwise rotating) eddy or meanders (see post here). She approached this anticyclone and swam northeast along its periphery. In the past 24 hours, Lydia has turned southeast of the previous anticyclone and has entered into the center of an adjacent anticyclonic eddy! 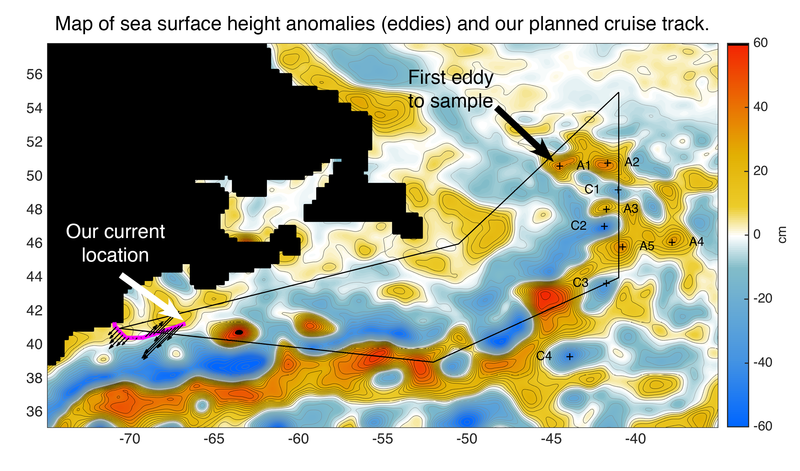 Analysis of her interaction with eddies during her trip offshore in the summer and fall of 2013 (find more info here) suggests that she prefers the cores of anticyclones over cyclones and makes repetitive deep dives (often over 800 meters) while in the cores of anticyclones. Her activity in the past few days suggest that she might be honing in on some cues, be they potential prey, mates, or other, and is occupying the core of yet another anticyclonic eddy. Lydia’s track overlaid on a map of sea level anomaly. Anticyclonic eddies and meanders are shown as orange and red features, cyclonic eddies and meanders are blue and purple features. This begs the questions: Do white sharks seek out anticyclonic eddies because they are areas that concentrate prey and/or potential mates, or do they prefer the warm water found in anticyclones while swimming elsewhere? We’ll keep a close eye on where Lydia goes from here and hope to be able to address these questions in the future. This entry was posted in Sharks and tagged lydia, Ocearch, satellite images, sharks on November 26, 2014 by pgaube.